"Birdwing Bungalow". This was taken when it was quite 'young' and it now measures about 7 inches (17cm) across. We don't know what it is called so would be interested to hear from anyone who recognises it! It's really beginning to feel as if winter is almost over as last night was much warmer and the forecast temperature today is a pleasant 28 C. Unusually for this time of year the past few days have been quite overcast and this morning there are a few sprinkles of rain, which is just what we need to freshen up the vegetation. As we approach the start of spring next month the dawn bird chorus is building-up and this morning a Wompoo Fruit-Dove was calling just outside our bedroom window. They are spectacular birds and their distinctive call is a deep "Wom--Poo". 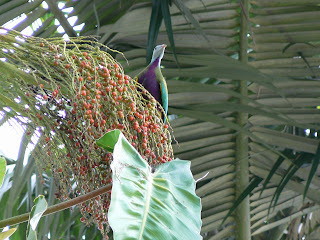 This one was feeding on the berries at the top of a palm tree outside the house. We really do need a little rain now to freshen things up as the dry season progresses. We are very fortunate to have a good water supply from a rainforest creek so can at least keep the grass fairly green (after all if we don't use the water it will simply run out to sea!). 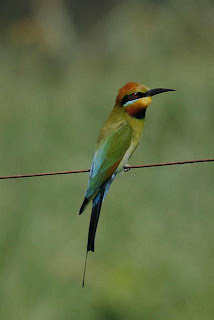 The Rainbow Bee-eaters are having a great time swooping down over the surface of the dam after insects and this beautiful shot was taken by John Gordon, a recent guest. In fact it was John and Meg's second stay with us and while they were here John took some wonderful photos which he has kindly given us permission to use. 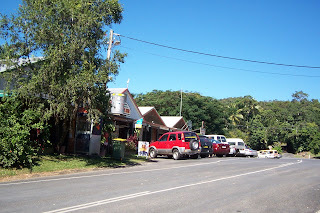 We will be adding some to our Daintree Valley Haven website soon. Thank you John! 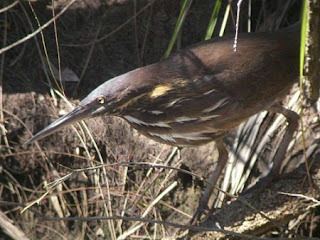 Yesterday I saw the first Black Bittern of the season taking off from 'Turtle Pool' in our wetlands-dam. Unfortunately I didn't have the camera with me so I have 'borrowed' this image from the Australian Bird Image Database (www.aviceda.org/abid/). They have nested here for the past several years so it's lovely to see the first one back yet again! We're feeling a little tired today after a great night at the Daintree Store restaurant, "Eleanor's Place" in Daintree Village last night. The new managers, Mary and Des, put on the first of what will be a monthly 'special' night - this time it was a Roast night with delicious beef and fresh vegetables for only $11.50. It was run in close collaboration with the Daintree School (only about 18 students) and our lively and enthusiastic Principal, Nathan, kept everyone entertained with raffles throughout the evening - prizes donated by local businesses - and not only just about lost his voice but managed to raise about $500 for the school. There was a huge turnout of locals (officially the local population is 'nominal') and visitors to our tiny Village and Mary said this morning that they served ninety-nine meals - a fantastic result. Now we're all looking forward to the next one! Yesterday we enjoyed a surprise visit by one of Australia's leading ornithologists, Lloyd Nielsen and his partner Dorothy. Lloyd is the author of many field guides to birds and is also an expert photographer and artist, with many of his photographs of birds and other animals being published internationally. We had a fascinating afternoon talking to them both and were thrilled when Lloyd gave us a signed copy of "Daintree Jewel of Tropical North Queensland", a wonderful book covering all the flora, fauna, local history etc. of our beautiful region. If you visit his website at http://www.birdingaustralia.com.au/ you will find heaps of information about Lloyd, his work and his books. 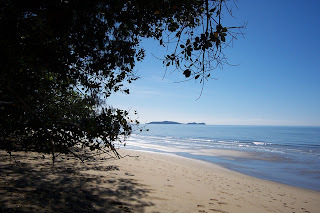 This may give you a taste of our beautiful Daintree region - between the Daintree and Mossman Rivers! 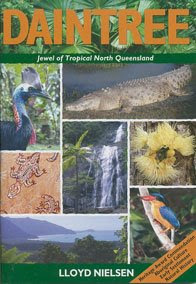 It was professionally created by David Vivian for the Daintree Village Tourism Association (www.daintreevillage.asn.au). Being our winter not many of our fruit trees are producing ripe fruit at the moment but we do have a few Bananas and also Carambolas (Five-Corner fruit). This is what's left of a small bunch today, so at least tomorrow morning our guests will have some home-grown produce on their breakfast trays. These are a variety called Ducasse and we think they really are the most delicious we have ever tasted. They are also sometimes called Sugar Bananas. A little Macleays Honeyeater pecks at the flowers of a newly-forming bunch. host tree is totally surrounded and finally dies. The photo at the top is of a Strangler Fig taking over one of our Jakfruit trees - very little of the Jakfruit is now visible and some of the dangling strands are taking root in the ground and will eventually form what look like vertical tree- trunks. 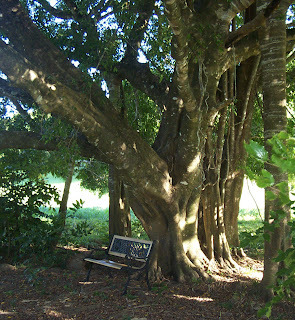 On the right is the base of a very old Strangler Fig on our walking track. The tree must be about 100ft high, and spreads out about the same distance. You can see several large 'trunks' which many years ago would have started from roots dangling from the branches. It was such a beautiful day that a take-away sandwich and cold drink sitting on the beach at Wonga, half-way home, seemed the perfect lunching spot. I had the whole beach all to myself and with the small waves gently lapping, a lovely view out to Snapper Island and with Cape Tribulation in the distance, I couldn't help reminding myself how incredibly lucky we are to live here! This is a common sight as you drive through the valleys, gentle Brahman cattle roaming lush farmland bordered by densely-rainforested hillsides. The following article was written by Ian Osborne and Laurie Taylor, both born-and-bred Daintree cattle farmers and appears on the Daintree Village Tourism Association website at http://www.daintreevillage.asn.au/. Sustainable Tropical Beef Grazing plays an important role in the economy of Daintree. It is the industry that has withstood time, whilst other have, for many reasons failed. Lush Daintree River flats produce young heavy weight steers off improved pasture and are well sought after by both export and local abbatoirs. Over the years many show ribbons and carcass competitions have been won. Cattle grazing on river flats, which need little or no fertilizer because of the sediments deposited during yearly flooding from the upstream large World Heritage Area, are sustainably grazed on the hillsides of the valley in the wet season to maintain the viability of each cattle property. Graziers stress it is important to manage and maintain these hillsides with grasses that provide good ground cover to prevent erosion as well as good quality feed. Hillsides are burnt before the storm season in 2-3 yearly cycles to maintain the quality of the improved pasture. Most cattle properties in the Daintree Catchment also retain large areas of tropical rainforest that has been sustainably logged over the last 100 years. As the Dry season progresses our wetlands-dam is starting to dry up, although it will fill up again very quickly once the rainy season arrives - sometimes as early as December but usually February and March tend to be our wettest months. Now the uncovered banks have new grass and late yesterday afternoon this little Swamp Wallaby came down to nibble at the fresh new shoots, while a pair of Pacific Black Ducks dived for food in the shallow water. This is a Spotted Tree Monitor who normally lives in the roof of our big old open-sided shed. We named him Claude (clawed) after the first time we heard him trying to climb up the outside of the iron roof (think fingernails screeching on a blackboard!). His tail is almost as long as his body so he's about 35cm from tip to tail. I was lucky to get this shot on the palm tree at the front of the house - when he sees you he usually shoots round the other side of the tree to be out of sight. reaching for an extra blanket. But today's forecast is for a perfect sunny Far North Queensland winter's day with a top of 26 deg C.
it looks as if later on there will be a bumper crop for the birds to feast on! As usual we will net a few lower branches in the faint hope that there will be a few lychees left for us! 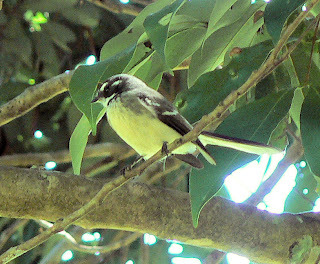 The trees are alive with little Grey Fantails flicking their tails and darting through the branches after insects. I took this photo yesterday - it's not very clear but you have to be so fast to catch one sitting still.